Thirty-three years ago – from July 24 to July 30, 1983 – took place one of the biggest massacres in Sri Lanka’s history. The perception of the Tamil people was that Black July 1983 was a crime well-planned by organized groups linked to the then Government. According to official Government statistics the number of those killed was 471 while the number injured was 3,769. The number of robberies was 3,835. However, unofficial reports say that the number killed was 2,000 and the number of Tamils displaced was around 150,000. Of the buildings destroyed were 8,000 houses and 5,000 commercial establishments. The value of property damaged or destroyed was estimated to be nearly 300 million U.S. dollars. During the past half-a-century successive Governments reached various agreements with Tamil parties on what they called the Northern question, the North-East crisis, the ethnic issue, Tamil Eelam and Federalism. An armed campaign to secure a separate state commenced in the early 1970s causing the deaths of nearly 60,000 people both in the North and South due to the terrorist actions of Tamil separatist groups during the past three decades. Incident at the Borella Bus Stand during Black July. The UNP Government signed the Indo-Lanka Accord with India on July 29, 1987 hoping to end the conflict. As a result nearly 100,000 Indian troops arrived in Sri Lanka between July 1987 and March 1990 and launched military operations against LTTE terrorists in the North and East but they proved unsuccessful. In the same period the JVP launched its second insurgency to protest against the Indian intervention among other issues. Consequently 41,813 people were killed in the South. However, 19 years later President Mahinda Rajapaksa succeeded in militarily crushing the LTTE on May 19, 2009 thus ending a 30-year armed conflict. Fifty-eight years ago, in August, 1957, the Federal Party (which was formed under S.J.V. Chelvanayakam’s leadership in 1949) announced its decision to stage a hartal and satyagraha to protest against the Official Language Act. The first step towards solving Tamil separatism was the Bandaranaike-Chelvanayakam Pact signed on July 26, 1957. Earlier on June 26 secret talks were held between Prime Minister S.W.R.D. Bandaranaike and Federal Party leaders at Horagolla. Thereafter discussions continued at the PM’s office on July 9 and at Rosmead Place and the Senate on July 14. The decisive meeting took place on July 25, 1957. The Pact was signed the following day but it was never implemented due to vehement protests. After Tamil separatists assassinated Jaffna’s SLFP Mayor and the party’s Chief Organiser Alfred Duraiappah on July 27, 1975 tensions increased in the North. On May 24, 1981 during the District Development Council Election the PLOTE (People’s Liberation Organisation of Tamil Eelam) assassinated UNP Candidate A. Thangaraja. Six days later two policemen on duty at an election meeting were shot dead. Reacting in anger pro-government gangs set fire to the four storeyed-Jaffna Public Library building (constructed in 1935) which had many invaluable books and around 97,000 hand-written manuscripts. Before and on the day of the District Development Council election several UNP Cabinet Ministers, including Gamini Dissanayake and Cyril Mathew and MP Gamini Jayawickrema Perera were sent to Jaffna. 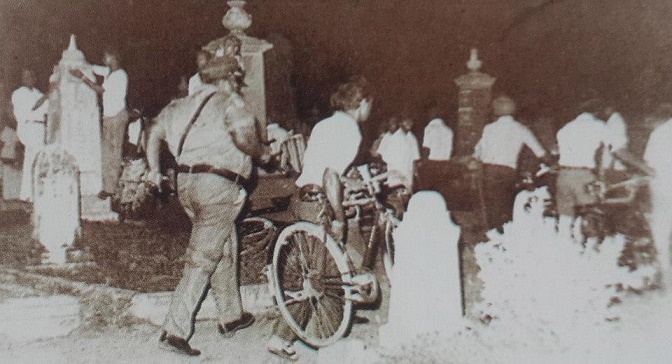 Police Superintendent Abdul Gafoor chasing away crowds at the General Cemetery, Borella on July 24, 1983. In July 1982 four policemen were killed at Nelliadi junction, Jaffna. In October of the same year terrorists attacked the Chavakachcheri Police Station killing three policemen before escaping with weapons seized from the station. Also, 1982 was the year when the UNP held the infamous referendum to extend its term in Parliament and secured 54.7 percent of votes. In October of the same year a Presidential Election was held and President Jayewardene won by 52.91 votes. Large scale violence and vote rigging occured during both the referendum and the election. When Opposition Presidential Candidate Hector Kobbekaduwa went to cast his vote he found that it had already been ‘cast’ fraudulently. On July 15, 1983 the Army opened fire at Chavakachcheri killing Tiger terrorists Charles Lucas Anthony alias Seelan (a close associate of LTTE chief Prabhakaran) and Ramanadan Arulnadan. The Tigers decided to avenge their deaths by planting landmines at Thirunelveli Road. On the night of July 23, 1983, a squad of 15 soldiers (Four Four Bravo Patrol) led by 2nd Lieutenant A.P.N.C. De Vas Gunawardena attached to ‘C’ Company of the Sri Lanka Light Infantry’s First Battalion, Madagal, were engaged in a road inspection. They travelled in jeep No. Army 4889 and Truck No. 26 Sri 3193. They had been also been ordered to arrest Sellakkili another close confidante of Prabhakaran and report to the Army Camp at Madagal. About five minutes past 11.28 p.m. when the troops were passing the Urupirai junction their jeep was caught in a deafening explosion followed by relentless gunfire. The jeep was driven by Corporal G.R. Perera. Only Corporal Upali Perera and Lance Corporal Sumathipala were able to escape from the 22-member Tiger terrorist group which sprang the ambush. Thirteen soldiers died in the attack. Army Commander at the time was Lietenant General Tissa ‘Bull’ Weeratunge. Arrangements were made to bury ther bodies at the General Cemetery, Borella where 14 graves had been for the purpose (Cpl. Upali Perera was mistakenly thought to be dead but survived with serious injuries). The dead were 2nd Lt. Vas Gunawardena, Sergeant I.S. Tillekeratne, Cpl. G.R. Perera (driver), Lance Cpl. G.D. Perera and Privates A.D. Mathapitiya, M.B. Sunil, A.J. Wijesinghe, K.P. Karunaratne, P.G. Rajatilleke, S.S. Amarasinghe, G. Robert, A.S. Manatunga (driver) and J.R. Fernando. Although it was announced that the bodies of the dead army personnel were to be brought to Borella on July 24, 1983 at 5.00 p.m. they were not brought until 7.00 p.m. The crowd at the cemetery became restless. They reacted violently after Police Superintendent Gafoor ordered a baton charge on several of the mourners. This writer was an eye witness to the incident. Angry crowds began attacking Tamil shops and houses in Borella and surrounding areas. These were happening at several places all over Colombo on the same night. Although earlier it was decided to take the bodies of the dead soldiers to their home towns, the decision was changed at the last minute and they were instead brought to Colombo. 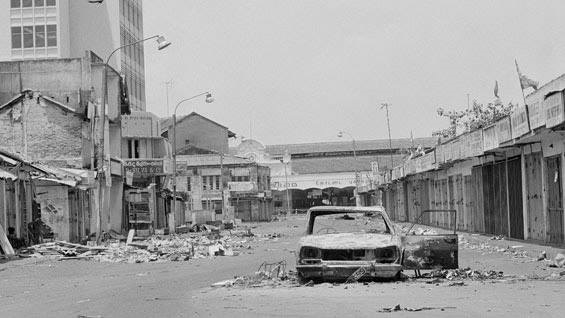 It was only on July 26, 1983 – 24 hours after the rioting occurred – that President Jayawardene declared curfew in Colombo. By that time organized attacks on Tamil people were continuing in Colombo and nearby districts. There were strong allegations that Cyril Mathew, a powerful Cabinet Minister, was directing the violence. His supporters and others linked to the Government, armed with voters’ lists, were looking for Tamil houses to attack. A trade unionist of the UNP-affiliated Jaathika Sevaka Sangamaya led the attacks in Wellawatte. The violence in Mount Lavinia was directed by a UNP Municipal Councilor. An underworld gangster organized the attacks in Pettah where 442 shops were destroyed and several were killed. It was only on the night of July 28, 1983 – five days after the rioting – that President Jayewardene addressed the nation. 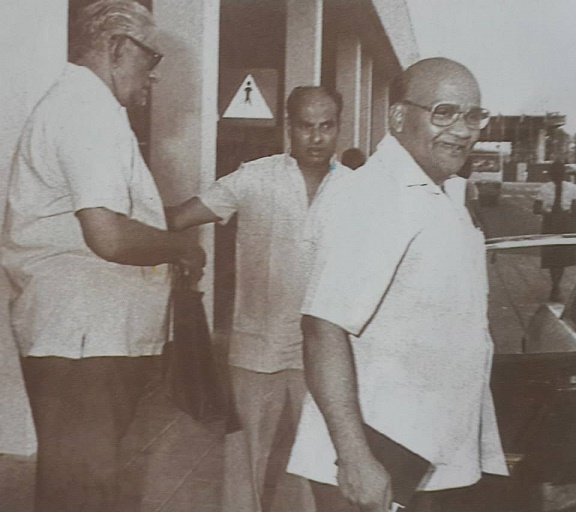 Five days before, on July 18, 1983 the President in an interview with Daily Telegraph, London, said that he was not concerned with the views of the Jaffna people and that he could not think about them or their opinion of the Government. Opposition Leader A. Amirthalingam and other Tamil MPs leave Parliament, after having lost their seats. After the rioting spread to Welikada Prison 35 Tamil Prisoners were killed at first followed by 18 others later. A total of 53 Tamil prisoners were killed between July 25 and 27. Among the victims were the founder of TELO (Tamil Eelam Liberation Organisation) Kuttimani and Jegan, another pioneer of the armed Tamil militancy. Kuttimani had been earlier sentenced to death by the Colombo High Court on August 13, 1982 after being convicted of killing a police constable in 1979. The curfew was relaxed in Colombo, Gampaha and Kalutara after a few days but patrolling by security forces continued. 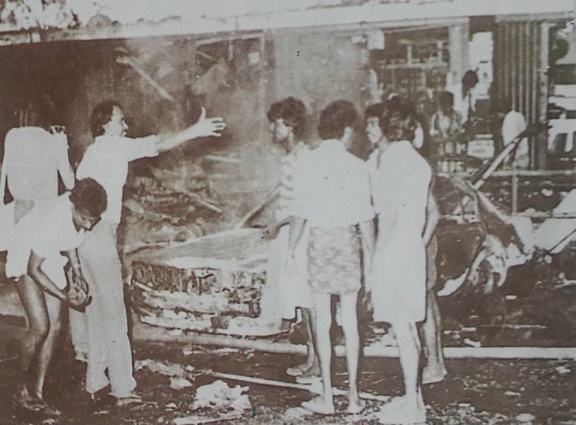 However a shooting incident involving three armed Tamil terrorists who had climbed the upper storey of a building near the Bo-Tree junction Pettah on July 27, 1983 caused tensions to rise again in Colombo and suburbs. The rioting spread like wildfire throughout the country from July 24 to July 30 resulting in organized Tamil groups chasing away Sinhala families in the North to the South. Hundreds of them were brutally killed in the North and East and their house and shops destroyed. The remaining property was forcibly seized. What the UNP Government did in response to international criticism about the Tamil pogrom was to proscribe by Gazette notification on July 31, 1980 three Left parties, which had nothing to do with the rioting. President Jayewardene’s explanation was that the ban was imposed following reports that the Black July incidents were a conspiracy by leftwing extremists against the Government. Accordingly, the JVP, the Communist Party and NSSP were proscribed. The CP and NSSP leaders who went into hiding for a short time surrendered to the government. Thereafter the ban on their parties was lifted. The JVP however did not surrender although there were national and international appeals to lift the proscription. Later the JVP engaged in clandestine political activity and in 1986 launched a second insurgency which ended with the deaths of 41,813 people including JVP Leader Rohana Wijeweera who was killed on November 13, 1989. Eventually, the UNP Government introduced the 6th Amendment to the Constitution, claiming it was mean to ensure the country’s territorial integrity. After an intense debate it was finally passed on August 8, 1983. According to the 6th Amendment every MP should pledge not to support the establishment of a separate state. Since the TULF represented separatism all Northern Parliamentarians and two from the East did not sign the pledge. Consequently 16 MPs including TULF Leader Appapillai Amirthalingam and R. Sambandan lost their seats on October 23, 1983. Anura Bandaranaike of the SLFP became Opposition Leader on November 8 the same year with the support of nine SLFP MPs and MEP Pariamentarian Dinesh Gunawardena and Communist Party MP Sarath Muttetuwegama. As a result of Black July 1983 Tamil separatist organizations in the North established their base of operations in Tamil Nadu. Thereafter within a decade the Indian Government under Prime Minister Indira Gandhi’s Leadership allowed the establishment of 110 terrorist training camps in India. The Indian Government openly gave them material and monetary assistance. We have to be very careful when discussing the incident of July 1983. If we divide into political camps and blame each other (UNP, etc. ), we are pandering into Tamil terrorists. Instead the matter must be looked at in the broader scheme of things and the nation. We must also not mix national security priorities with morality. The two are separate issues. What happened in late July 1983 was the result Tamil terrorism, not the initiation of the UNP or SLFP. Since July 1975 Tamils launched a campaign of terrorism against Tamil Christians and Sinhalese in the north. Sinhalese numbering over 20,000 in Jaffna District in 1971 were reduced to a mere 5,000 by 1981 mostly due to Black August (1977) by Tamils. A plane were bombed in 1978 and banks were blasted in dozens in 1970s by them. Boatloads of bombs were transported by Tamils in 1970s and early 1980s. Some of these were provided by India. It happened well before 1983. Tamil terrorist groups set up camps in Madurai, etc. in South India way before July 1983. They also trained with Palestinian Terrorist groups in the 1970s. It is wrong to say these terror groups set camp in Tamil Nadu after July 1983. Tamil Diaspora (though not known by that name) started helping terrorism in Sri Lanka way before July 1983. A group of Tamil doctors in the UK organised themselves into EROS in the 1970s and helped establish the first Tamil terror group in the 1970s. Very few Tamils that left Sri Lanka as refugees participated in anti-Sri Lanka work. Most of it is done by educated Tamils who left to western countries as skilled migrants. Tamil Diaspora has sent many times more money to their relatives in Sri Lanka (billions of dollars) than to LTTE ($200 – 300 million before it’s financial activities were substantially banned in 2006). Sixth Amendment and PTA introduced around this time remain the most useful and intelligent moves by any Sri Lankan government since 1948. Unfortunately, these were not implemented as they should. TNA’s post-war stellar rise is the result of this deficiency. It is now clear the 1983 riot was caused by Tamil groups to seek refuge in rich countries in the west and escape the impending war they knew coming and the bad effects of the open economy on the north (which thrived under closed economic policy in the 1970s). It is malicious and unwise to blame the government or Sinhalese for it. Today ISIS is doing the very same thing. It stirs up violence in Iraq, Libya and Syria to displace a large population of Arabs to Europe where they expand and some of them engage in violence. Interestingly, the Tamil Diaspora will integrate with the Arabic Diaspora in western nations – two groups that follow similar tactics and the two largest number of terror groups even today. (Muslim and Tamil terrorist groups dominate the list of banned terrorist groups. While over 80% are Muslim groups, 4 are Tamil – the second highest). This is the approach Sri Lanka must take on the matter. Anything else is wrong and causes more damage to Sri Lanka, it’s good name and it’s war against terror. Not sure what the purpose of publishing this by Dharman. It may be aimed at UNP but it back fires on Sinhalese. Dilrook is right, even some Tamils say this was cunning ploy of Tamils to go to western heavens. I have written this before in this forum. This was the reaction of the Sinhala people to killing of unarmed Sinhalese by Indian terrorists. This was a well planned killing by the Indian terrorists trained, armed financed managed and branded Tamil Tigers by the Indian Union. Indian intelligence Service the Third Eye knew what the reaction of the Sinhalese that included Muslims and Christians to the cold blooded butchering of the unarmed Sinhalese by the Indian terrorists. It was carried out to coincide with the World Council of Churches’ international gathering in Canada. Mr Wikramarathna that is how more than 300, 000 Indian colonial parasites went to Canada. The first five photos were widely circulated around the world and the media by the Indian intelligence service, the first one particularly. Jaffna library was et fir e by the same Indian terrorists to show the world that the Sinhalese are uneducated and to get the sympathy Baptist Church of the US and the World Council of Churches which they are a member. Agree with Dilrook and S. Gonsal. 1983 Riots were trumped up. In fact, the Tamil leaders Tamil Separatism started way back in the 1930s, during the time of the British Raj. 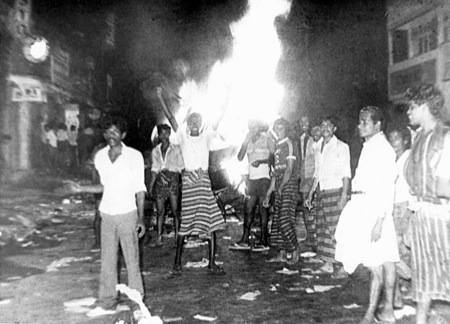 The Riots of 1983 were a part of the Tamil Separatist movement. 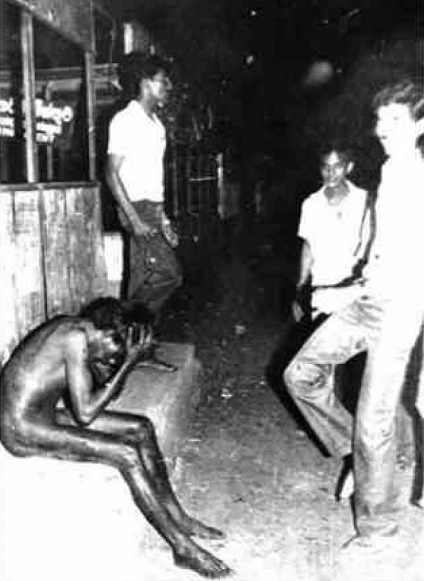 Some folk abroad make out that the Tamils were ‘innocent,looking at the sky and helpless’ when the “awful Sinhala” (Buddhists) attacked them in July 1983. Not so. These were Cold War times and Tamil Caste Wars of the North were there too. These two players got together and orchestrated most of it. The high cost of near 500 yrs of Colonisation and the Colonial Plantations Industry & Indentured Labor from Tamil Nadu area laid the corner stones for Tamil leaders Tamil Separatist ideas. The British created the Tea Plantations and brought Tamil Dalit indentured labor numbering over a million. The Dutch brought some half a million Tamil Dalit indentured labor to work in their Tobacco plantations. In reality, the Tamil folk are fighting for their independence from Tamil Nadu Caste structure. They do their Caste fights in Sri Lanka and not in Tamil Nadu. By 1983, the Tamil population of Lanka enjoyed Free Education & Free Health Care. The Tamil Language was in place (SWRD), and best of all, no CASTE stated on birth certificates as done in Tamil Nadu. Freedom to practice their religion was also in place in Lanka. How and why the Tamils were plunged into acts of violence prior to the 1983 Riots was due to Tamil Leaders putting in place the violent Vadukoddai Resolution in 1976 – Tamil Eelam through violence. Therein lies the core of the problem, and Cold War players latched onto this. All the facts of the Riots when put together point to the truth that the 1983 Riots were orchestrated so that the nearly million strong Tamil Diaspora could be formed in the west. The Vadukoddai Resolution of 1976 is still in place, not yet officially revoked. The Vadukoddai Resolution of 1976 should be officially revoked and Tea plucking machines introduced to the govt held tea areas whilst the Tea workers ought to be residing outside the tea plantations. The Upcountry Tea areas are the only areas that still have some genuine grievances coming from the British colonial times. Other Tamil folk of Lanka have all the rights Others of Lanka have. They have no genuine grievances. The present day Jaffna Uni troubles are also orchestrated for the same purposes as prior to the Riots of 1983. These Tamils who cause troubles are hoping for a Sinahal back lash, as happened in the 1983 Riots ! More Tamils Go West, draw in the UNHRC further into the fray, and also form Tamil Eelam in Lanka, seems to be their goals. Solve Tamil problems in Tamil Nadu where Tamil problems of social structuring through Caste begin. Sri Lanka had nothing to do with those problems. Message to Yahap : Do Tamil political leaders really want RECONCILIATION with the Others of Lanka ? If the Tamil leaders of Lanka really desire Reconciliation, they should officially revoke the Vadukoddai Resolution, shouldn’t they ? Emphasis on : Other than the Upcountry tea pluckers/workers grievances, the grievances of Tamils in the other areas of Lanka are similar to the grievances of the Others of Lanka in similar circumstances. Not only were the photos circulated, but also films were made of the 1983 Riots and given to the 3 Tamil Ambassadors then in London, Paris & Bonn (Moorthy, Balachandran & Lakshmi Naganathan) who had shown these films to the VIPs there. To show the west that it were Sinhala attackers, some of them were dressed up in white ‘jatawa’ & white sarong (tucked up) in the old Sinhala style …. Many people were witness to this. I saw one in Kirullapone area – he stood out as he was dressed up in that manner. This fellow had wide staring eyes and he carried a long wooden pole which he held with both hands horizontally, and swung from side to side – he seemed to be drugged. We had with us in our car a Tamil co-worker who could not reach her home. We took her home with us. She was with us for about 3 days. It was difficult for us as groups of rioters were roaming around looking for opportunties to threaten people and loot homes. She told us she was surprised that we ‘lived so simply’. She had been told in Jaffna that the Colombo Sinhala folk lived in luxury, and had ‘homes with marble floors’. So, you see, it was all planned way ahead with lies. May some good come out of this tragedy, for all, with the truth of matters pouring out. Here are a few important and significant events that were not highlighted. These show how the Arch Anti Sinhala Traitor J R Jayawardene manipulated the unfortunate situation to put blame on the Sinhala Buddhists. Once the curfew was in place 24 hrs after the commencement of unrest and more than 8 hours after the organised riots, on four consecutive days, four very significant statements were made over the Television – Rupavahini Channel. While a shocked population waited with abated breath for the Executive President to address the nation, the UNP government and the Church plotted behind the scenes to place the blame entirely on the shoulders of Sinhalese Buddhists. 1. Most Ven Madihe Pannaseeha Maha Nayake Thero was asked to address the Nation first. Naturally the Mahanayake Thero requested the Nation to have patience and be calm. The nation was angry but it was in no mood to go on a killing rampage. By getting him to address the nation J R Jayewardene got the world to believe that the Mahanayake Thero was really addressing the Sinhalese Buddhists and that they were responsible for the pogrom. 2. The second was made by J R Jayewardene (the man with the professional mourners face- DB Nihalsinghe had to dress him for this occasion and it is mentioned he had a task to get his face in one place for the occassion)himself, , as the President of Sri Lanka. He justified the riots as the justifiable anger of the Sinhalese for the killing of the 13 soldiers in Jaffna. Here he clearly laid the blame for the pogrom on the Sinhalese. It must also be noted that UNP Goon Squads and every shade of hooligan, Sinhalese, Tamil, Muslim and other took part in the universal phenomenon of looting that followed throughout the island. In many instances old scores were settled, regardless of ethnicity, taking advantage of the deplorable and unfortunate situation. 3. The third statement was made by R Premadasa the Prime Minister a servant of the Wijewardhana clan. He said that behind the riots was a coup organized by a Naxalite Terror Group. This was a diversionary attempt to put the blame on the pseudo socialist group led by the Catholic – Vijaya Kumaranatunge who was masquerading as a Buddhist at that time. 4. The fourth and final statement was made by Ananda Tissa de Alwis the then Minister of Communications and Constitutional Affairs. He said the next stage of the coup would be for Sinhalese Buddhists to attack Sinhalese Christians. His was the voice of the Christian Church who would finally go to convince the world that Sinhalese Buddhists were highest common denominator of what happened and responsible for the carnage. With this they killed two birds with one stone; firstly the blame for the pogrom was laid firmly and squarely on Sinhalese Buddhists and secondly they set up the Christians against the Buddhists. The essence of the above four statements show the way J R Jayewardene and his administration manipulated the media to put the blame, for the riots by his Goon Squads, on Sinhalese Buddhists. It is doubtful if the Mahanayake Thero knew how he was manipulated to lay the blame on the Sinhalese Buddhists. The subsequent propaganda by the State media and the Christian Church convinced the world that it was the Sinhalese and especially the Sinhalese Buddhist who were responsible for the July ‘83 Riots. There were many groups attempting to destabilise and grab power in Lanka. All these groups did they negative actions and laid the full blame on the Sinhala Buddhists of Lanka. Dharman’s article is warning for Sinhala Buddhists and Others of Lanka not to fall into foreign traps to ‘divide & rule’ Lanka. Dharman’s article shows how Lanka must safeguard her Youth from all sectors of society. Education geared for Jobs a must. From now onwards, safeguard the integrity of the Legal System of Lanka which is endangered right now with the Missing Persons Office work to be taken over by foreign hands if allowed to become Law. The Cold War has finished. Russia is part of NATO. China in NOT a threat. China has sold off $18 Billion of the US Debt held by China (total of 1.3 Trillion was held by China, whilst most of the $18.1 Trillion US Debt is to its own agencies), and Japan has sold off $22 Billion of the US Debt. (See net for details of US Debt).